He's kept his mouth shut long enough. They say money talks… and this money has a lot to say! As the man on the hundred, Ben is not pleased by what he sees in America today and he’s done keeping his mouth shut. Over the course of this 90-minute musical comedy, Ben is passed from a hedge fund manager, to a stripper, to a judge, to his mistress who’s a nun, to… well, you get the idea. Armed with a lifetime of famous sayings, Ben must convince everyone to change their priorities before it’s too late. 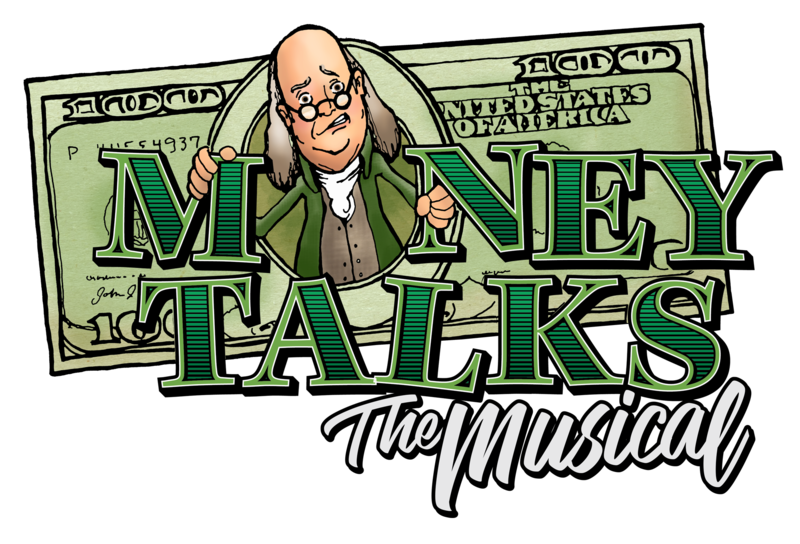 Inspired by the writings of Ben Franklin, the play La Ronde, and the huge mess America is in today, Money Talks is a fast-paced madcap romp filled with life, liberty and laughs for all. recently appeared Off-Broadway with his son, Lowell Byers, in Luft Gangster, written by Lowell. Broadway: The Music Man, Big River. Off-Broadway: Promises, Promises, Petrified Prince, Edwin Drood, Sunday in the Park. Henry IV Part I (NYSF Delacorte), 2 Julius Caesar’s, 2 Hamlet’s (NYSF), No End of Blame (MTC). Regional: Glass Menagerie, The Scarecrow, Lakeboat, Death of a Salesman. Film: Set It Up (just completed), Regarding Henry, Working Girl, Star Trek. NY Television: “Madame Secretary,” “Elementary,” “House of Cards,” “Law & Order SVU,” “Boardwalk Empire,” “The Good Wife.” Grateful love to my family, and my actor’s wife of 38 years, Daphne. Broadway: Honeymoon in Vegas, South Pacific, High Fidelity. Off-Broadway: Clever Little Lies, Ring Twice for Miranda. Regional roles at Goodspeed, Sacramento Music Circus, Paper Mill, and North Shore. TV: “The Blacklist,” “Blue Bloods”. Film: The Intern, So Good to See You. has two Tony nominations for Book and Lyrics of a Musical for Anna Karenina (composer Dan Levine). AK has had 3 acclaimed tours in Japan. With David Friedman, created Chasing Nicolette (based on the French romance, Aucassin and Nicolette), produced at Westport Playhouse, the Prince and Village Theatre in Seattle; Stunt Girl, about Nellie Bly, New York City’s first female reporter, which premiered at Village; and Desperate Measures, a 6-person western, loosely based on Measure for Measure. Songs: Listen to My Heart, Help is on the Way, We Can Be Kind, My Simple Christmas Wish, hundreds more. Conducted/Vocal Arranged: Disney’s Beauty & The Beast, Aladdin, Pocahontas and The Hunchback of Notre Dame, plus 6 Broadway musicals. Wrote songs for Diana Ross, The Lizzie McGuire Movie, Aladdin and the King of Thieves, Bambi II and Trick. New Musicals: Desperate Measures, Aucassin & Nicolette, Nellie Bly, and King Island Christmas. Off Broadway Revue: Listen To My Heart – The Songs of David Friedman. Produced all of Nancy LaMott’s CD’s. Has written over 100 songs for the Today Show’s Everyone Has a Story segment. NYC: Irma La Douce, Zorba, Do I Hear a Waltz? (Encores), Passion (Classic Stage), The World Will Not Contain Us (his own original musical written with Christopher Shinn, recent readings with The New Group). More at davidhancockturner.com. Broadway: The Columnist. Off-Broadway: All the President’s Men (The Public), Troilus & Cressida (Shakespeare in the Park), Second Chance (Asst. Proj. Designer, The Public), Completeness (Asst. Proj. Designer, Playwrights Horizons), Shen Wei Dance Arts (Projections Director) Reginal: 45 Plays for 45 Presidents (MRT). Other credits include: Columbinus, Three Sisters, Ruined, Rags, Good Soul of Szechuan, Sweet Charity, Bright Lights Big City, Girl Gone & Thoroughly Modern Millie as well as multiple productions around the world. is the owner/founder of BobbiePinz, LLC; where he specializes in wigs for drag queens, celebrities and theatrical. Favorite Off-Broadway Credits: Disenchanted, BedBugs!! !, Drop Dead Perfect, Forbidden Broadway: (Alive & Kicking and Comes Out Swinging) and countless NYMF and College productions. Television: “RuPaul’s Drag Race,” “RuPaul’s Drag Race All-Stars 2” and “Snooki & JWoww”. He has worked on over 20 Broadway productions including shows Jersey Boys, Wicked, Mary Poppins and Cinderella. Visit BobbiePinz.com. Broadway: A Gentleman’s Guide…, Dames at Sea, Lion King, Nice Work… Off-Broadway: Puffs, The War Boys, Trip of Love, iLLA: A Hip Hop Musical (NYMF), Missed Connections, Encores! (15 productions). National Tours: A Gentleman’s Guide…, Lion King, White Christmas. Film/TV: How You Look At It, “Carousel” (PBS), “Six by Sondheim” (HBO), “SYTYCD,” 50 Shades of F*****d Up. Other: Broadway Dance Lab, Hartford Stage, NY Philharmonic, Shakespeare Theatre Company (DC), SF Symphony, TUTS, TUTS Underground, & others. is a happy Equity stage manager and free-lance production manager based in New York City. Professional credits span Broadway, regional & international theater, corporate & educational events, concerts & promotions. is a theatre artist (director, performer, writer, designer, stage manager and producer). Bell is the artistic director of Virago Stage and Screen and a member of Caborca. Her feminist satire the Dancing Boobies Trilogy: Lecture and Reenactments has been performed at the Brooklyn Museum and the Center for Performance Research. She has had the pleasure of working extensively with Dangerous Ground, Stolen Chair, One Eighth, Three Day Hangover and the Institute for Psychogeographic Adventure. Performing artist/Choreographer based in NYC. She is excited to be making her Off-Broadway debut as an associate choreographer in not one, but two shows; Money Talks and Endangered! The Musical. Recent work includes Rock N’ Roll Debauchery’s Burlesque Dreams (Off-Broadway), Zanza Steinberg’s PERŸPLEXED (Off-Broadway), and Buglisi Dance Theater’s Table of Silence (Lincoln Center). Her Choreography has been seen in The Fall (Dorothy Young Center for Preforming Arts), The Most Miserable Christmas Tree (World Premiere), and at Broadway Dance Center (2016 Performance Project). is the former Associate Director of the Vermont based company Act Three Theatricals, and is thrilled to receive her first Off-Broadway and NYC credit with this show. Many thanks to the entire Money Talks team for lots of fun and a job well done! To her family, friends, and loved ones, no amount of thank-you’s could possibly suffice. Without you and your constant support, none of this would be possible. This newly formed theatre, film and television production company brings together the talents of its two principals, Michael Chase Gosselin and Tim Sulka. In addition to Money Talks, Visceral Entertainment is producing the original musical, Midnight at The Never Get, with a limited engagement this summer in Provincetown, MA, and Endangered! The Musical, also at the Davenport. Other projects in development include the holiday musical, The Most Miserable Christmas Tree, a new Broadway musical comedy, Pope! An Epic Musical, an audience immersive musical stage adaptation of the Jonathan Lethem novel, You Don’t Love Me Yet and a stage adaptation of the novel The Black Ledger, by D.G. Allen. Film and television projects include Urbn FaeryTales, a musical television series of familiar fairy tales set and filmed in modern day Brooklyn, and Prime Cuts, a film of the darkly comic graphic novel, a teen version of the Sweeney Todd legend. FineHeart Productions is… Musical. Comical. Lyrical. Compassionate. Historical. Hysterical. Topical. Transformative. Adventuresome. On Broadway: LOMBARDI ON BROADWAY; GODSPELL. Off-Broadway: ENDANGERED! A Super Stormy Musical; MONEY TALKS. Regional/other: TRUTH THE MUSICAL; Swami Pajamananda & The Light-Hearted Path. Productions that Awaken the Senses, Illuminate the Mind, Revitalize the Heart, Elevate the Spirit. Love, Life and Theater… is the Fine Art of FineHeart. Sue Cohen: Sue is a first-time producer with Money Talks. She recently completed the 14-Week Program at the Commercial Theater Institute. Sue is a graduate of Dartmouth College and holds an MBA in Finance and Theater Management from Columbia Business School. Eri Nakano: Eri has had various business professional experiences in different fields, and she is always very happy being in the theater world. She is a graduate of the Commercial Theater Institute Program. Amy E. Gewirtz: So excited to have Money Talks as my first commercial producing credit! Proud Commercial Theater Institute graduate. Investor in the recent Broadway revival of Spring Awakening and the upcoming The Band’s Visit. Co-founder of Liquid Theatre Collective, liquidtheatrecollective.org. Fred Rohan-Vargas: Fred Rohan-Vargas is the founder and executive producer of Mixing It Up Productions, LLC. He is the author of several plays that have been produced throughout the country and abroad. Merrie L. Davis: 25+ years marketing experience owning IN and WHERE Magazines. Merrie now produces/markets NYC theater. Producing credits, Broadway: Gigi, Eclipsed. Off-Broadway: Himself and Nora. Her “out-of-the-box” marketing skills were utilized in Allegiance and 39 Steps. Merrie is the head of her company, Next Act 2 Follow. Jamie deRoy: Currently 1984, The Play That Goes Wrong, The Band’s Visit. 3 Tony Awards (Norman Conquests, Vanya And Sonia, Gentleman’s Guide), 3 Drama Desk, 6 Outer Critics, 2 Drama League, 2 Off-Broadway Alliance Awards. 44 Broadway and 36 Off-Broadway Shows. Film: Broadway: The Golden Age Trilogy. TV: “Jamie deRoy & friends”.